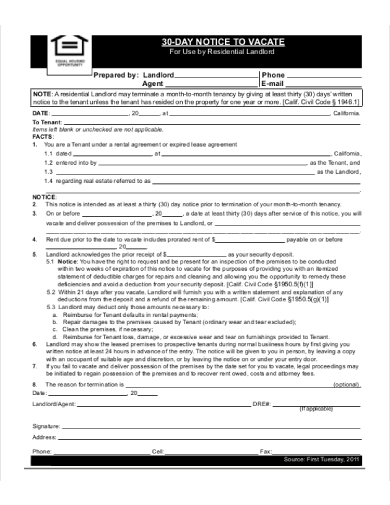 If a tenant fails to meet his or her obligations in a lease agreement or wishes to move out of the residence on a personal term, a 30-day notice to vacate is generally made to give the tenant enough time to make the necessary arrangements. A notice is essential in these settings to ensure that both parties are able to meet their obligations as stated in the contract. When a landlord wants a tenant to move out of the building, or vice versa, a notice to vacate letter is written to make this request. This is done so both parties are informed of this change beforehand. The document should discuss what needs to be settled within the following weeks from when the letter is received. 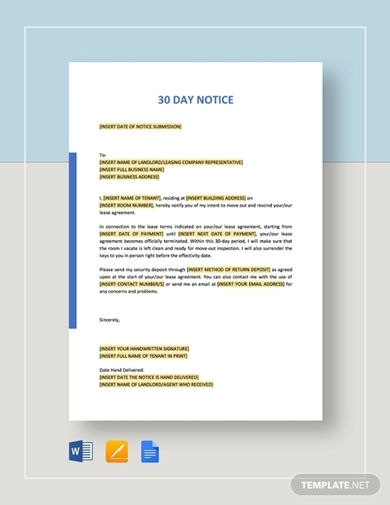 But because it’s important that either party is able to state the details needed to finalize the vacancy, it’s best to use a template to standardized your notification letter. A few months shy to the end of your lease, you might have found a new apartment that you consider more suitable compared to the living situation you are currently in. You make an inquiry, send your requirements, and an acceptance letter confirms your request to move in. You might be eager to make the move right then and there; however, your landlord has a strict policy against tenants who fail to send a notice ahead of time. If you find yourself in a similar situation, feel free to download the template provided for a smooth relocation. Rental agreements are legal documents that must be abided by the parties involved. Failing to do so may lead to various consequences in the court of law. So if you want to notify your landlord of your intention to terminate your residency, a full 30-day period must be rendered before it is made effective. This also means that you are leaving the residence at your own free will. Although tenants are not obliged to indicate their exact reasons for leaving, it is sometimes stated in the notice for landlords to be aware. Landlords or companies that own a building or several units in an apartment complex are usually open to bed, room, or floor rentals. This makes it possible for at least one person in the unit to move out while the rest stay behind and make up for the rental payments. If you and your roommates wish to leave the residence together, a formal notice must be written on behalf of the entire group. It’s also vital for each resident to sign the document to verify what was mentioned. Before you leave your apartment to live in a lavish loft in the city, make sure your landlord is notified of your intention through a 30-day notice to vacate the area. 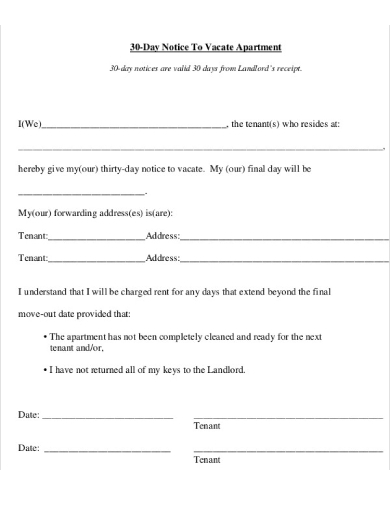 A simple notice will inform the landlord of your exit as well as your final day of residency. The content of the notice is usually kept brief and coherent, similar to the example above. Any letters or packages that were mailed to the apartment even after the tenant’s relocation may be forwarded to the address mentioned in the document. Late rental payments and rowdy boarders are every landlord’s worst nightmare. Even when running a business, you do have the right to take action against the factors that affect you and the rest of your clients. Thus, residential landlords are advised to send an eviction notice to terminate one’s tenancy. 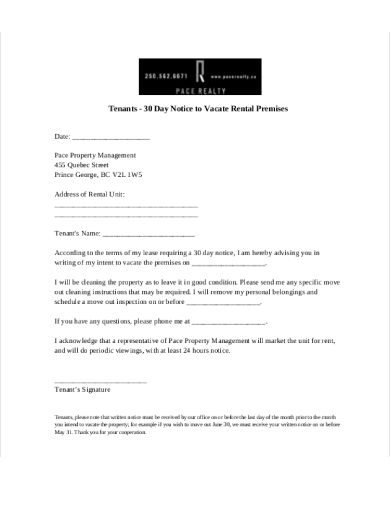 A notice to vacate form is often supplied by property management companies for landlords to use when the time calls for it. As required in your rental contract, a notice to vacate the house property must be addressed to the landlord for the resident to terminate his or her tenancy. A 30-day notice, which may also be a 21-day to 90-day notice, is mandated by state laws to protect the rights of both landlords and their tenants. For this reason, it is your obligation to adhere to these policies by providing a printed notice to document these changes. 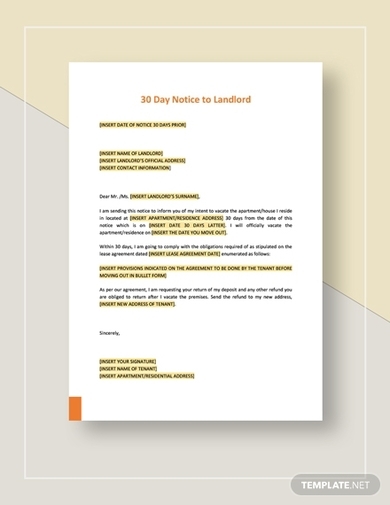 If the terms in your tenant lease agreement require a 30-day notice, be sure to submit the notice to your landlord to avoid a possible penalty. Your intent to move out of the rental premises must be made known to the property manager regardless of the circumstance. 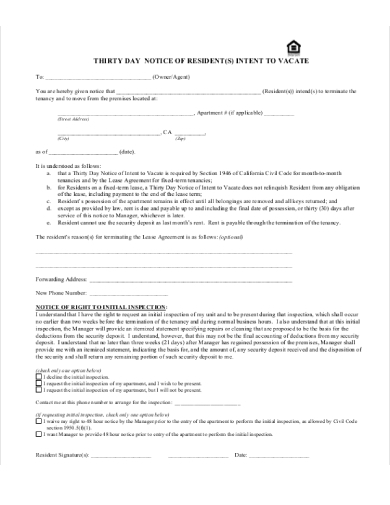 Shown above is an example of a professional 30-day notice to vacate that residences of the given property can use as inspiration when constructing their own copy. 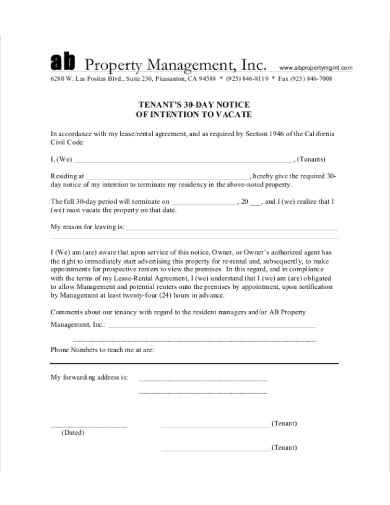 To inform the property manager of your intent to terminate your tenancy, the best you can do is to prepare a letter or form as proof of notice. 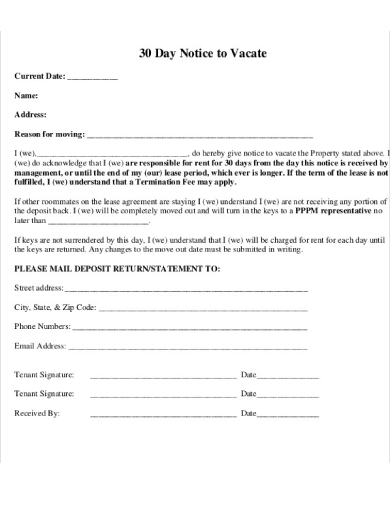 A 30-day notice to vacate letter or form written by the tenant should contain the details that landlords may require when finalizing a termination. You can use the given example as a basis for writing your notice or you can ask your landlord for the required format to be followed. 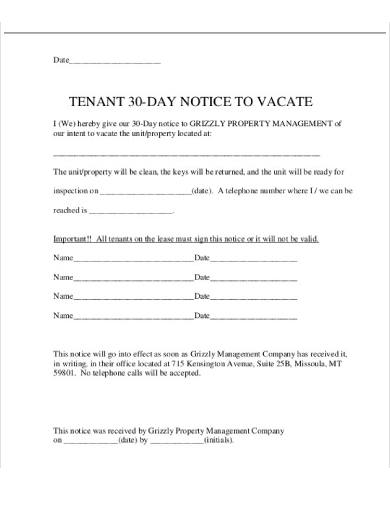 This is an example of a 30-day notice to vacate provided by a property management company for their tenants to use. 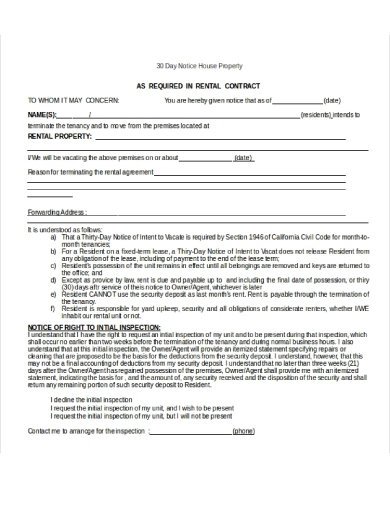 If your landlord happens to supply these documents for your convenience, you can simply request for a copy of the notice and fill it with your personal information. The details indicated in the notice should remain accurate to prevent any problems with your agreement.